Bankura district has many important places worth mentioning. Though Bankura town is the district headquarters, most of the tourist places in this district are centered in and around Bishnupur. This sleepy town is famous for its 17th and 18th century terracotta temples and the Jhapan snake festival in July-August. Bishnupur is also well known for its music, silk and tussar industries, brass and bell metal products, conch shells and terracotta toys. Air: The nearest airport is at Kolkata, 151 km from Bishnupur and 185 km from Bankura town. Rail: Bankura and Bishnupur are well connected by train services with other important towns in the State. Road: A network of National Highways running through the district connects Bankura with other parts of the country. Bankura Town: This town is famous for its terracotta, metalware and temples. The temples here are built mostly of brick and laterite. The terracotta, Bankura horse is symbolic of India’s craft tradition. Dalmadal Cannon: This large canon located near Racs Mancha, is a medieval artillery piece that was used successfully against the repeated Maratha attacks in 1742. Centuries of exposures to weather have not rusted this 4-meter long cannon. Ramakrishna faith. The birthplace of Saint Ramakrishna’s wife, a temple has been erected in dedication to her. Jor Bangla Temple: Constructed in the form of two Bengali hut-shaped buildings, joined together and surmounted by a single ‘Shikhara’, this brick temple built in 1655 A.D. is architecturally fascinating. A unique example of the individualistic architecture of Bengal, the temple is profusely adorned with illustrated terracotta work. 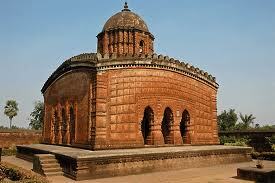 Madan Mohan Temple: Built in 1694 A.D., this temple is one of the finest and largest temples in Bishnupur. The temple stands on a 16-meter square base and has a white facade of 12 metres. The terracotta panels here are especially noteworthy. Malla King’s Fort: The gate of this old fort is made of laterite stone and is called “Pathar Darwaza.” Among the objects found here, the stone chariot in laterite has been ascribed to the 13th century. Of the seven lakes that served as its moat some are still there in a semi-dried condition. Malleswar Temple: The only Shiva Temple in Bishnupur. The architecture of this temple is so different that it cannot be placed in any particular class of temple architecture of this region. Its architectural style is described as Rekhdeul. Mrinmoyee Mandir: Dating back to 997 A.D., the Mrinmoyee Mandir is one of the old places of worship in this area. The Durga idol here is made of clay and the courtyard contains a rare spectacle of nine trees growing together. Mukutmanipur: A vast wooded dam site across the Kangsabati and Kumari Rivers, Mukutmanipur is known for its idyllic scenic beauty. The dam site is ideal for a quiet holiday. Panchmura: This village is famous for the terracotta Bankura Horse, a folk artifact. This piece of art is now the national symbol for Indian handicrafts. Ras Manch: Resembling a steeped pyramid, this splendid edifice was built in the early 17th century when Bishnupur was steeped in Vaishanavism. The shrine was intended as a meeting place for all the Vaishnavite deities of the other temples that were brought here in a majestic procession on the occasion of the annual Raas Festival. Susunia Hills: A delightful holiday resort in winter, these hills are ideal for rock climbing and trekking. Rock inscriptions dating back to the 4th century A.D. can be found on the walls of the caves here. Shyamal Rai Temple: Built in 1643, this temple is the oldest among the Pancharatna temples. Built in brick with a fine ‘Shikhara’ on a carved Bengali chala roof, this temple is an invaluable token of Bengali culture. Vishnupur: The temple town of Vishnupur in Bankura District, the seat of the Mallah kings of Central Bengal, is a unique heritage site famous for the exquisite craftsmanship of terracotta art work evident in the numerous temples and the Vishnupur Gharana of music, the handicraft of clay/wooden horses and Baluchari Sarees. This entry was posted in Bankura, West Bengal and tagged bankura district, Bankura Maps. Bookmark the permalink.